This is honestly a pretty fantastic creature. It helps to stabilize the ground against Aggro decks and even has hexproof. *facepalm* Tell me I'm not the only one who glanced at this and thought they read, "Mesmerizing Behind". Seriously speaking, this is VERY interesting. Blinking this is going to be a thing for sure. 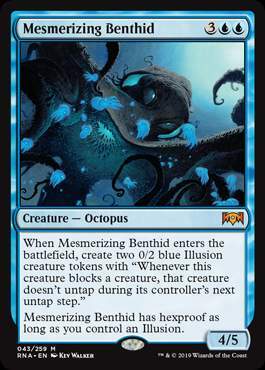 I read it as "berthid", so I knew it was a Simic card, but thought, like a ship's berth. I also read it on my phone. I think the thing I want my hexproof beaters to have the most is sacrifice fodder for edict effects that would seek to bodybag them. Card seems downright fantastic.